The Orient is well known for its riches, fortunes and most of all, its wonderful precious jewels. This is why Microgaming invites players to go on a great journey to the Far East, the Orient so they can see these marvelous jewels and claim their own share of the beautiful jewels of the orient. Microgaming creates the wonderful environment of the Far east through the visuals and the entire Orient dominated interface of the game. 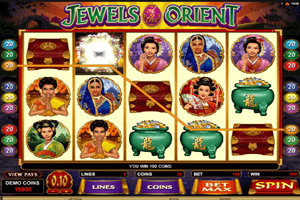 Play Jewels of the Orient Slot here. The theme is apparent in the symbols of the slot as players will a Chinese lady, a Japanese lady, an Indian lady and an Indonesian lady, all of them wearing the outfit their country is known for. Other symbols include the logo of the game, jewels in a green pot and a red treasure chest. These symbols are seen on the 9 lines of the game and the five reels. The logo of the video slot is its wild icon. So whenever the Jewels of the Orient logo land on the reels, it means that players will have a higher chance of claiming a payout since it can replace any other non bonus symbols to form the highest winning combo. The Asian house is the scatter icon that will trigger the free spins round. Players will earn a number of spins according to how many scatters are on the screen. Players need a minimum of three. The round offers from 10 to 40 free spins with multipliers that vary between 1 and 120x.